By now, you know that my love for jasmine extends well beyond skincare. So it only seemed fitting for my eleventh post in the #12DaysOfJasmine series to focus on bringing this “King of Flowers” into your home. 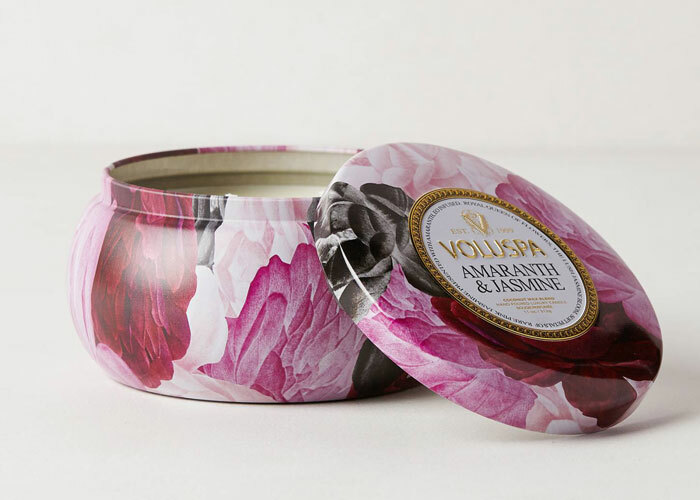 I’ve found my favorite jasmine-infused candle in Voluspa’s Amaranth & Jasmine Maison Metallo Candle. Seriously. I buy these in pairs for my tiny one-bedroom apartment. This candle smells that good. Pink jasmine (Jasminum polyanthum) comes together with essential oil-infused amaranth in Voluspa’s candle to create a warm yet sweet scent that’s truly jasmine, but with a softer, sweeter, less heady aroma. The coconut wax-blend candle burns relatively clean and features a double wick that helps the wax pool evenly and beautifully after lit. One of my favorite things to do on spa nights in is light this candle, begin my skincare and bodycare routines and then enjoy the soft, floral scent that’s easily my favorite of all scents (king of flowers, it is). While I don’t talk much about home products on the blog, I will say that I look for beautiful, reusable, cruelty-free candles with cotton wicks. Voluspa’s candles fit the bill. I also love that the wax is made with a blend of coconut oil (finally, a way you ladies who are sensitive to coconut oil can enjoy it in your home! ), which produces a better burn (though you’re still going to get some smoke and blackness). These beautiful tins are wonderful for reusing as jewelry holders or as bookshelf decor (though, again, if you’re like me and have already purchased four of these candles, you may just need to recycle!). Another great idea: storing your mini facial oils or travel beauty! What a chic storage unit, no? So, while things like candles don’t typically get a ton of space on the “lifestyle” component of this blog, I couldn’t resist including it in my #12DaysOfJasmine series to illustrate to you how crazy I am about this scent. I must have all the jasmine-infused things! Jasmine lovers, have you found a great jasmine candle or other home scent? Any beauty lovers out there secretly obsessed with candles? How do you prefer to scent your home? Tell me in the comments section!